Learn how to use and teach Kidpower's assertive advocacy, boundary setting, and self-protection skills to protect children and teens from bullying at school, home, online social media and gaming, and out in your community.Protect kids from bullying and empower them with skills! Learn how to use Kidpower practices to create cultures of caring, respect, and safety at school, at home, and in your community. 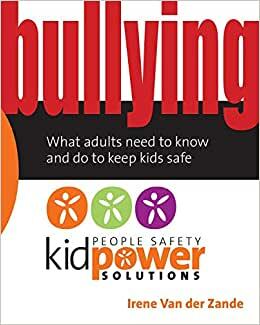 These vivid stories, entertaining examples, and clear step-by-step explanations of what to say and do are relevant for addressing bullying with all young people, from toddlers to teenagers, and are even useful in dealing with adult-to-adult bullying.According to Gavin de Becker, best-selling author of The Gift of Fear and Protecting the Gift, "Kidpower provides simple, practical skills to avoid confrontations and make victimization less likely. The bottom line is that Kidpower has an exceptional track record in the field of personal safety and violence prevention. "Foreword by Ellen Bass, co-author of The Courage to Heal and Free Your Mind.Learn more at www.Kidpower.org and check out our abundant FREE online library of resources. Just a heads up to kindle buyers- this book is digital but doesn't have any kindle functions like bookmark, highlighting, go to page/location. I'm on chapter 4 now and wish I could do all of those things! The book has lots of great info but I have no way of marking my electronic copy. Even if I makes notes on a notepad, finding a specific page again isn't easy. 5.0 颗星，最多 5 颗星Let's get this in more schools. Take about eroding the base of school/playground violence.Covers the bases for those wanting to know the answers-responses and/or actions to take that best deny victimization. The material offers the means to shape a positive attitude of confidence in poor situations.This subject matter should be part of each schools curriculum-period! Highly recommend this book to anyone who is a parent or who has worked with teens and pre-teens alike. Information that is easy to understand and easy to follow...be proactive and help kids help themselves...empowers kids and provides helpful answers to questions parents face when a child comes home asking...what do I do now?